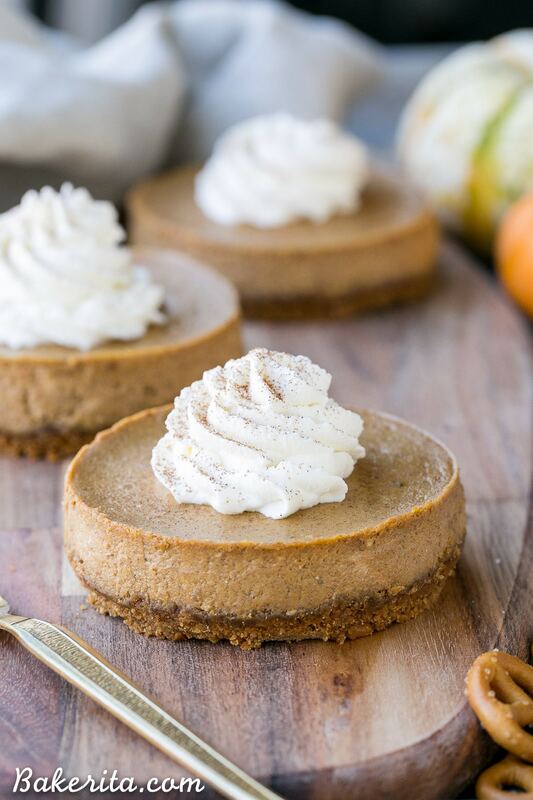 These Mini Pumpkin Cheesecakes have a crunchy, salty pretzel crust that pairs irresistibly well with the spiced pumpkin cheesecake filling! Topped with a swirl of whipped cream, this is a gluten-free dessert everyone will go nuts for – it’s perfect for the holidays. I’m drowning in pumpkin goodies! And really, I couldn’t be more excited about it. Fall is always interesting to me in the food world, because it seems like one of the only times that seemingly EVERYONE bands together to use the same ingredient over and over for a few months: pumpkin! Walking into the grocery store is a mind-boggle of pumpkin spice everything in your face – I had to laugh when I walked into Trader Joe’s and was surrounded with pumpkin spice almond milk, pumpkin waffles, pumpkin spice tea (<— actually a major win, though), pumpkin pasta, and even pumpkin spiced pumpkin seeds (seems like pumpkin inception right there). In truth, though, the pumpkin craze is a delicious one and forces all of us food bloggers to come up with unique, outstanding pumpkin recipes that will stand out in the sea of orange, cinnamon-spiced goodies. So today’s pumpkin offering to you? 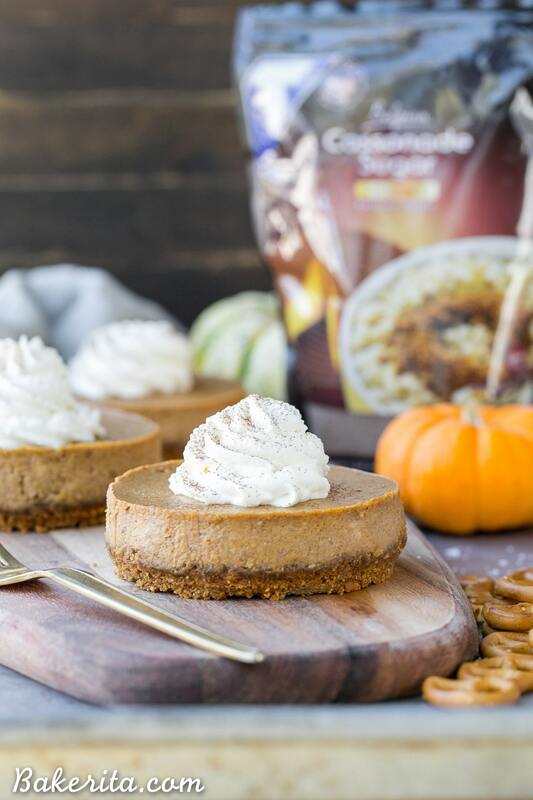 Super creamy Pumpkin Cheesecakes, with warm spices like nutmeg and cinnamon, and a crunchy, salty twist in the form of a pretzel crust. Let’s talk about that pretzel crust though, because it’s kinda my new favorite thing! I made a pretzel crust for this Chocolate Peanut Butter Tart and I absolutely adored it – super crunchy and added a little bit of saltiness to contrast with the sweet filling. With these mini pumpkin cheesecakes, the crust plays the same role, adding flavor and crunch and a bit of a salty bite. To keep it gluten-free, I used gluten-free pretzels (I recommend Trader Joe’s brand or Glutino), but obviously, if gluten isn’t an issue for you, regular pretzels will do. A crust isn’t anything without something glorious sitting on it, and thankfully this pretzel crust has a rather outstanding friend to share the spotlight with – the pumpkin spice filling is super creamy, has loads of warm spices, and is lightly sweetened with T-Sugars Belgian Cassonade Sugar. The Belgian Cassonade Sugar, which is a dark caramel-y brown sugar, adds an extra depth of sweetness and flavor to the cheesecakes and helps make the crust extra solid and crunchy. I opted to make minis because they’re more manageable than making a whole big cheesecake, and I think they’re more fun to eat too  I used my mini springform pans but since that’s not something most of us have in the kitchen, I also included instructions for baking these in a muffin pan. The cheesecakes are baked on a low temperature to make sure the insides are baked through before the outside starts to dry out, and they’re slow-cooled by turning off the oven and opening the door at the end of their baking time to help prevent cracks. Topped with a swirl of whipped cream, these are a dessert you’ll be happy to share with guests or serve on a holiday – Thanksgiving, anyone? Creamy, crunchy, warmly spiced…what more can you ask for from a pumpkin dessert? Enjoy! Preheat the oven to 350°F. Line a muffin pan with 8 muffin liners, or grease three small springform pans with coconut oil. Combine crushed pretzels, coconut oil, and sugar and stir until the crumbs are moistened. Divide between the lined muffin tins and use a small flat-bottomed measuring cup or shot glass to press the crust evenly into the bottom of the liner. Bake for 8-10 minutes or until the crust is golden and firm. Let cool while you prepare the cheesecake filling. Preheat the oven to 300ºF. With an electric hand mixer, beat the cream cheese and Cassonade sugar until smooth and fully combined. Add the pumpkin, vanilla extract, salt and spices and mix at low speed until combined. Add the egg and stir just until well incorporated. Don’t over mix or you’ll create bubbles in your cheesecake. Divide the cheesecake batter evenly between each muffin tin or pan and bake until the middles of the cheesecakes are set and don't jiggle when the pan is tapped, about for 17-20 minutes for the muffin tin size, or 22-26 minutes for the larger springform pans. When they don’t jiggle anymore, turn off the oven, open the oven door at least 1 foot, and let the cheesecakes cool in the oven to prevent cracks from forming. Once they're completely cool, about 1½ hours, remove from the oven and refrigerate for at least 2 hours or until ready to serve. Serve with whipped cream! These are adorable! How have I never seen mini springforms? I need to get those so I make these goodies. Being on the pumpkin! Ever since August hit, I’ve been on the hunt to try all of the new pumpkin flavored goodies that I could find at my grocery store. There’s literally pumpkin flavored EVERYTHING! These mini cheesecake are so adorable, Rachel! And that pretzel crust is such a great idea. I think I would devour these all in no time! How cute are these ? I LOVE not sharing my desserts haha! Totally diggin’ the salty pretzel crust with the sweet and creamy cheesecake filling! Also hail to pumpkin everything! I feel like I’m over the pumpkin craze and onto Christmas, but that’s probably only because I am secretly in the middle of my Christmas baking! Lol. These look so perfect and I LOVE a pretzel crust on anything! 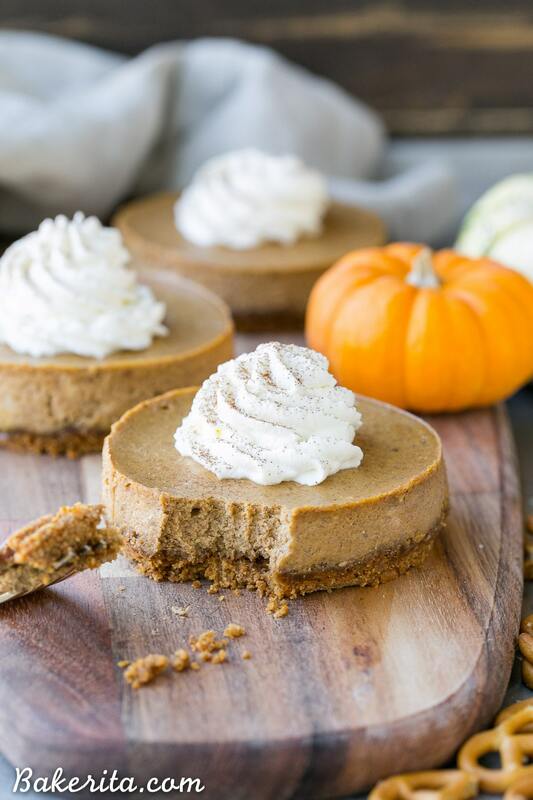 I would love to make these pumpkin cheesecakes! I have two daughters with gluten sensitivity&I’m always on the lookout for new and unique recipes. We love Glutino gluten free pretzels&honestly can’t tell that they are g-f! I have never seen passionate brown sugar for sale,however. I believe they are from France? Could I use American brown sugar? If so,would I use light or dark? I really want to make these mini cheesecakes for my daughters! Thanks! Hi Barbara – aren’t those pretzels so good?! You definitely can’t tell they’re GF. T-Sugars brand is now selling Cassonade sugar, which is indeed from Europe, in the US! You can find it at Safeway, Albertsons, and HEB, but if you don’t want to track it down, regular brown sugar will do the trick. You could use either dark or light, but I think dark would be delicious here and replicate the caramel flavor of the Cassonade sugar. I hope you love them, Barbara! I just made some pumpkin cheesecakes yesterday and I was missing this delicious pretzel crust! These look amazing Rachel — they’re so pretty! How are these little cheesecakes SO freaking genius?? I’m seriously drooling right now, Rachel! I have a deeeeeeep obsession with pumpkin cheesecake and now you’re telling me I can have it healthier?? Sign me up! I just love everything about this! I’m a big fan of pretzels in desserts, and when that dessert is a pumpkin cheesecake – even better! Okay, 100% adorable and 1000% delicious. These little guys look SO good… I’m totally losing it over the pretzel crust! Love! These look great! I love the pretzel base! 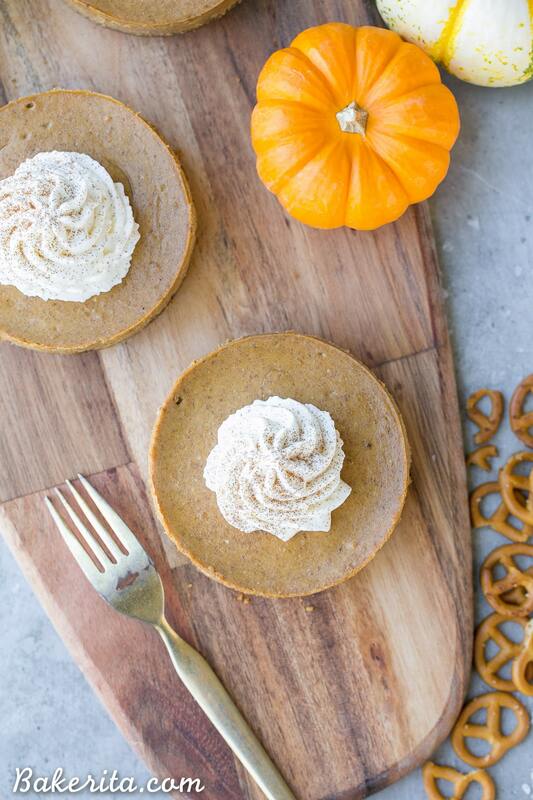 wow this pretzel pumpkin mini cheesecakes looks sooooo sooooo perfect and I think they taste likes heaven. I love everything with pumpkin that’s why fall is my favorite time of the year. I definitely have to make them like ASAP. But I have one important question, what is a mini springform for you? I mean which size? 4 inches? Or smaller because I want to prefer exactly one in this size. Thanks sooooo much. Thank you for your AMAZING, & perfectly approachable recipes! Generally speaking, for me, cooking gf & healthy, are not as difficult as it tends to be for me, when trying to bake gf & refined sugar free. Amazingly enough, all of the recipes I’ve attempted of yours, have been superbly smooth& easy to follow. I’m wondering if in this recipe above, coconut sugar, could be used as a replacement for the Belgian or Brown Sugars? Hi Jill! So glad you’re enjoying my recipes – such a compliment to hear that you’ve enjoyed them all :) you could certainly use coconut sugar in place of the brown sugar here. I hope you enjoy the cheesecakes! Hi Rachel! I’m planning on trying to convert this recipe into a dairy free one. Any suggestions? Thanks. 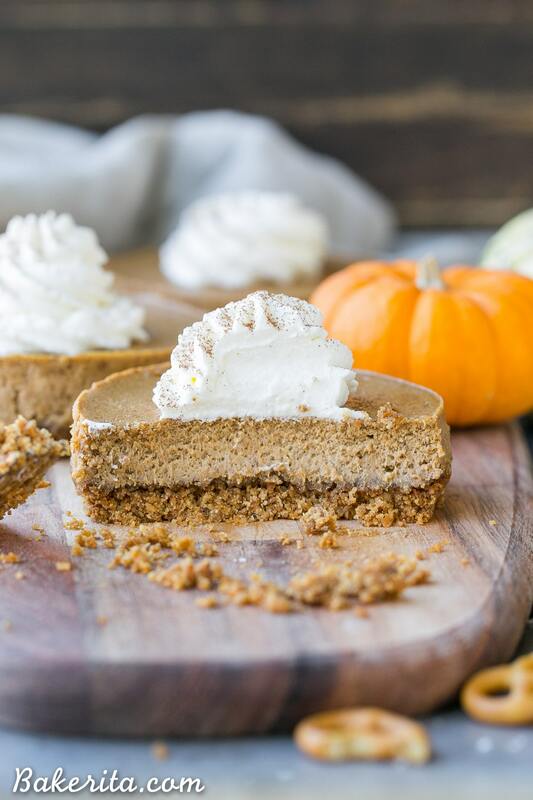 Hi Mary, you could sub with dairy-free cream cheese or for a fully vegan cheesecake you could use the filling from this pumpkin cheesecake and the crust from this one!